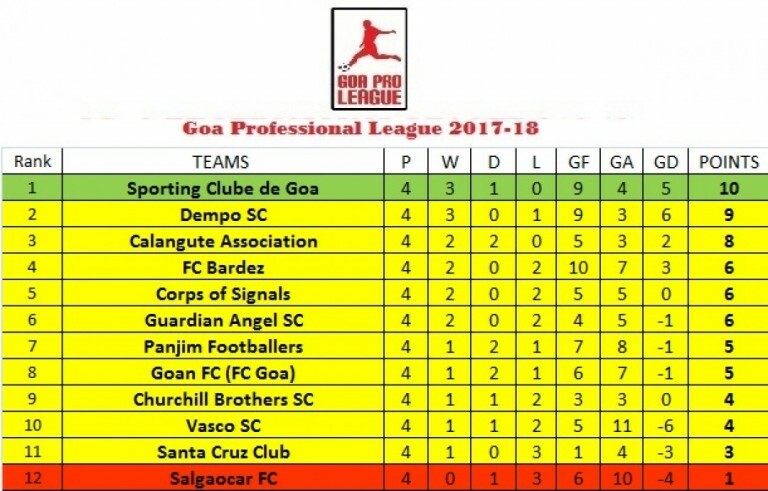 Football club de Bardez came from a goal down to beat defending champions Salgaocar Football Club 2-1 in Goa Professional League match played at Duler Stadium earlier today. Bardez were yet to beat the Green Brigade in the Goan football history, whereas their recent form was also poor as they had suffered hammering 4-1 defeat at the hands of FC Goa. On the other hand, Salgaocar were also experiencing the same as they were yet to register a win in the season. Bardez coach Armando Colaco made only one change to his side as Stanley D’Silva was back in the starting XI, whereas, Salgaocar coach Norberto Gonsalves gave the first start to U-20 keeper Nora Fernandes and Nigerian striker Joel Sunday in the playing XI. Joaquim Carvalho and Samuel Costa were also amongst the new faces in the Green Brigade’s lineup. After some midfield play, it was Bardez who came with the first attempt of the match in the 7th when Jessel Carneiro tried to find his teammate Kirtikesh Gadekar with a cross but Salgaocar defender Lenny Pereira flicked it for a corner. 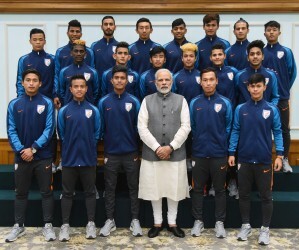 At the other end, Sunday made a swift run taking opponent defender Stanley with him but Bardez keeper came off the line to intercept the Nigerian striker, the ball later rolled to Devendra Murgaonkar who shot wide from outside the box with Bardez keeper completely out of position. 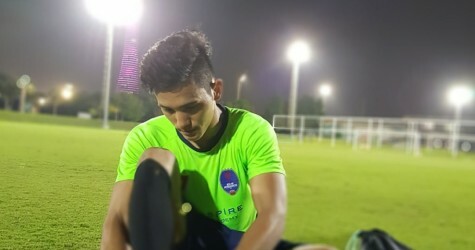 A few minutes later, Sunday had another chance but this time he failed to control Gilbert Oliviera’s cross in the box as Bardez Custodian took over the ball. In the 36th minutes, Devendra found unmarked Brian Mascarenhas with a perfect through pass but once again Bardez keeper Aliston Fernandes came up with excellent save as he paired the ball for a corner. However, Bardez keeper was helpless in the 39th minutes when Salgaocar’s Brian found Lenny from the corner who sent it to Skipper Rosario Mendes with a header pass, who again headed it to well-positioned Sunday in the goalmouth. The Nigerian striker also used his header to put the ball in the goal making it 1-0 for the Vasco based club. Three minutes later, Salgaocar had the best chance to double their lead when Sunday made an individual effort but his shot missed the target by a whisker from just inside the box. Bardez regrouped and came out stronger in the second half and took just 10 minutes to equalise as Clinton Niasso cut past a defender and tried his luck from the top of the box which beat the Salgaocar keeper and entered the goal making it all square for the Pink Brigade. A few minutes before this, Bardez’s Shubham Desai had the best chance to put his side on the level when he drilled a powerful shot on the goal from inside the box but Salgaocar keeper Nora pushed it for a corner. Meanwhile, Salgaocar once again came close to take the lead as Sanson Pereira shot on the goal from inside the box but Bardez keeper Aliston nicely fisted it over the crossbar. Energized by a equaliser, Bardez came out all attacking and found the winner in the 68th minutes when Jessel covered some before blasting from inside the box but the wingback was denied by woodwork, however, Clinton who was unmarked in the box made an easy tap-in to confirm their first win over Salgaocar in the history of Goan football.